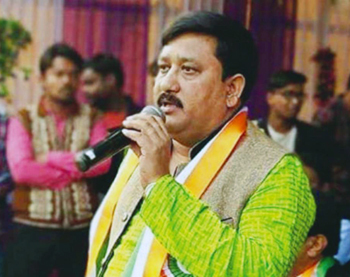 Nadia, Feb 10: Two persons have been arrested in connection with the killing of Trinamool Congress (TMC) MLA Satyajit Biswas in Nadia in West Bengal, police said on Sunday. Biswas, who was elected from Krishnaganj in Nadia district, was shot dead by unidentified assailants at a Saraswati puja on Saturday. Those arrested have been identified as Sujit Mondal and Kartik Mondal. The police have also suspended the officer-in-charge (OC) of Hanskhali Police Station. However, the reason for his suspension is yet to be known.An FIR in the case was registered on Saturday. According to police sources, the lawmaker was shot multiple times from a close range when he was coming down from the stage after attending the event. The TMC has alleged that the BJP got Biswas eliminated, a charge denied by the BJP. 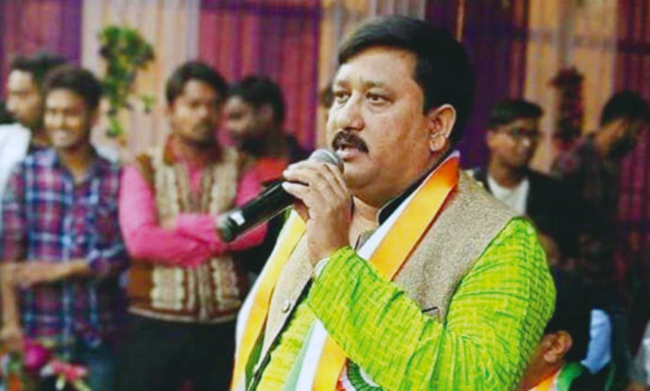 Gauri Shankar Dutta, TMC's district president, alleged on Saturday that BJP leaders conspired to kill Biswas as he defeated the BJP candidate by a huge margin. "Satyajit Biswas was BJP's target for a very long time. He had been a preventive wall for attempts of Mukul Roy and Soumitra Thakur for movement of 'Matua' community votes to the BJP. The murder of Biswas is the handiwork of Mukul Roy. He is touring these days across the area to strengthen the BJP. He is the conspirator. Roy had earlier lashed out at Satyajit Biswas. We will fight it (the murder case) and ensure that justice is done," he alleged. "The BJP is playing politics of bloodshed in the state," he claimed. Roy, a former leader of Mamata Banerjee-led Trinamool Congress, left the party in 2017 and joined the BJP. Nadia district Zila Parishad member, Santosh Kumar Guha, said, "Satyajit Biswas was a good person. We doubt if he had any enemy. Political parties like the BJP have always been thinking of removing Biswas from here. So someone from the BJP must have killed him." Denying the allegations, the BJP claimed that factional feud in the ruling party was behind the attack. BJP state president Dilip Ghosh said, "This is utterly tragic. This shows even lawmakers of the ruling party are not safe in the total lawlessness of Mamata Banerjee's Bengal. In the last few months, each time a TMC leader or a supporter is killed, they blame our party. How can the BJP kill a TMC MLA? Our security itself is in question." "We would like to tell the central government that this is the situation in Bengal where even a ruling party lawmaker is not safe. How will the Trinamool Congress government protect the people of the state? People in the state are living at the behest of God," Ghosh said in a video on his Twitter handle.